Twenty-five months. That’s how long Saeed Abedini has been behind bars in Iran for his faith in Jesus Christ. Torture, unspeakable living conditions, and an inhumane lack of medical treatment have marked the drawn-out experience of the thirty-four-year-old pastor who, as of late, has exemplified the horror of modern Christian persecution. On Sunday, November 9, Church of God congregations around the world will unite with other believers to pray for the global persecuted church. In advance of this vital initiative, Church of God missionaries have weighed in on the extent and gravity of persecution in the world today. One Church of God missionary in a tumultuous part of the world recalls the many times she has witnessed, or experienced firsthand, persecution. Ruth Lyons remembers one story of a man whose son was held at gunpoint until he would deny Christ. Though he was not killed, he was banished from his family. Not long after this traumatic event, his wife divorced him and kicked the son out of the home, saying, “Take this idiot. He is no good to anyone now.” This same son, dismissed as worthless, serves as a worship leader today. While serving Christ in ex-Soviet Central Asia, Ruth herself was captured by intelligence officials who warned her, “We have ways of making you talk.” Though under arrest, she remained faithful to the Lord and drew strength from the words of Matthew 10:19–20, “But when they arrest you, do not worry about what to say or how to say it. At that time you will be given what to say, for it will not be you speaking, but the Spirit…” (NIV). Thank God for her continued protection, which she never takes for granted. Far from the media spotlight on ISIS crises and Islamic extremism, pockets of terrible persecution also persist. David and Barbara Miller, regional directors for Church of God Missions in Latin America, have prayed with many locals who have faced serious persecution. 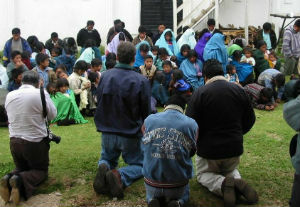 One hotbed for Christian persecution is Chiapas, Mexico. There, fifty thousand Christians have been forced from their homes and into a life of grave poverty by village chieftans called caciques. “If these Christians renounce Jesus, as the caciques demand, they can avoid such a fate,” David explains. “I have not heard of anyone ever doing that. Instead, they ask believers to pray that they would remain faithful to the Lord through the persecution. Angel and Jeanet Pinto are two examples. They simply will not let persecution keep their ministry down. The Pintos, who have pastored Pledge to Love Church of God for twenty-seven years, have suffered in the crosshairs of violence spawned by drug trafficking and guerilla warfare. September saw the latest killing, which took the life of a four-year-old member of the church’s children’s ministry. Though initially consumed with rage to avenge his father’s death, young Gabriel Narvaez ultimately gave his heart to Christ. Similar to many stories of those who have endured persecution for their faith in Christ, Narvaez’s story doesn’t end at conversion. “Today he is and active evangelist and church planter,” David says. The International Day of Prayer for the Persecuted Church is November 9, 2014. For more information, visit www.idop.org. For a related story released by Church of God missions, read this gripping account of Christian persecution in Pakistan. This entry was posted in All Church of God, Global Strategy and tagged David Miller, global, IDOP, International Day of Prayer for the Persecuted Church, missions, persecution, prayer. Bookmark the permalink.